UEM Land Holdings Bhd is set to launch property projects worth about RM5.5 billion across Malaysia this year. As such, it anticipates sales to increase to RM3 billion, about 50 per cent more than last year's sales target. Its managing director and chief executive officer Datuk Wan Abdullah Wan Ibrahim said the locations for the company's new projects would include Johor, Mont Kiara in Kuala Lumpur, and Bangi and Kajang in Selangor. "We expect the demand structure for our properties to take a new dimension. We expect a dramatic increase in take-up (of our properties). "So, we are targeting sales of properties worth RM3 billion this year. Last year's target was at RM2 billion," he told reporters after the signing of a joint-venture agreement with Medini Security services Sdn Bhd, a wholly-owned subsidiary of Iskandar Investment Bhd, here yesterday. In fact, Wan Abdullah said, the company has managed to achieve last year's sales target of more than RM2 billion. He, however, declined to disclose the exact sales figures. "At any one time when we launch a project, 85 per cent of the units offered are always taken up. And in the past two years, our sales team had managed to achieve our target. "So the board decided to raise the target bar for 2012 ," he said. 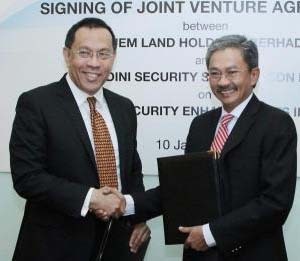 Under the agreement sealed yesterday, UEM Land and Medini Security have agreed to form a full-fledged security services company to provide enhanced security for Nusajaya, one of the five nodes of Iskandar Malaysia. 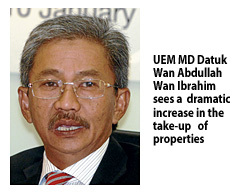 Asked on UEM Land's properties in Nusajaya, Wan Abdullah said since 2006, the company has managed to sell some 3,500 units of properties there, noting that sales only picked up over the last few years. "Sales were slow in the beginning, but over the last few years, they have been increasing dramatically," he said. PETALING JAYA: UEM Land Holdings Bhd has raised its sales target to RM3bil worth of properties for 2012 compared with RM2bil that it achieved last year. “We will be launching RM5.5bil worth of properties throughout Malaysia this year, with a sales target of RM3bil,” managing director and chief executive officer Datuk Wan Abdullah Wan Ibrahim said. UEM Land had already met its sales target of RM2bil last year. The company would unveil the actual figure when it announced its financial results for the fourth quarter of 2011, Abdullah said after a signing ceremony to mark the company's collaboration with Medini Security Services Sdn Bhd. Security assurance: Wan Abdullah (right) exchanging documents with Iskandar Investment president/CEO Datuk Syed Mohamed Syed Ibrahim after signing a joint venture agreement to offer security services in Nusajaya. UEM Land would form a joint venture (JV) with Medini, a wholly-owned subsidiary of Iskandar Investment Bhd, to provide full-fledged security services in Nusajaya, one of the five nodes of Iskandar Malaysia development in Johor. The JV would expedite the implementation of the overall safety and security initiatives and control the quality of security services in Nusajaya. Abdullah said the deal was significant as it would help address the negative perception that many people have towards the safety and security aspects in Johor, and help reassure potential investors besides attracting investments to the state. To initiate the security effort, UEM Land had deployed 20 auxiliary policemen from Mont Kiara, Kuala Lumpur, to be stationed in Nusajaya. Abdullah said the JV company was expected to have 160 auxiliary police men deployed in the development by 2015. He said the JV had allocated RM8mil as capital expenditure for 2012. Of the amount, RM4mil would be used to procure vehicles and equipment while the remainder for operation expenditure. He said that the JV company was not a profit centre. The company, he said, would earn revenue from the security services it provided for various projects in Nusajaya. GEORGE TOWN: Penang-based property developer Belleview Group will unveil new projects with a development value in excess of RM500 million this year in the northern region. Its managing director, Datuk Sonny Ho, yesterday said besides two launches on Penang island, the company is also set to launch first condominium project in Alor Star, Kedah. "We are working with the state authorities to try and change Kedah's landscape and introduce condominium living by bringing in projects similar to the ones we have been doing in Penang for three decades," he told reporters after the official opening of the 1st Avenue mall here yesterday. 1st Avenue is a joint-venture project between Asian Retail Mall II Ltd (a pan-Asian fund managed by the Pramerica Real Estate Investors Asia Pte Ltd), Belleview Group and the Lion group. Ho said the Amansuri Residences project along Jalan Darul Aman in Alor Star will boast two towers, comprising 22 and 24 levels respectively. "The project will be sited on a 1.21ha of land and will comprise 277 units, with floor areas ranging from 1,200 to 3,000 sq ft and priced at around RM350 per sq ft," he added. On Penang island, Belleview will launch its RM200 million Moulmein Rise mixed development project in the Pulau Tikus area by the middle of this year. "We will offer, among others, commercial, small-office, home-office type units, along with upmarket condominiums in a 27-storey block close to the Pulau Tikus market," Ho said. Also to be launched are eight bungalow units along Jalan Utama (also known as Western Road). The "W Residence" project, which carries a gross development value of between RM70 million and RM80 million, is expected to be completed by the middle of 2014. Meanwhile, Pramerica Real Estate Investors Asia chief executive officer Victoria Shigera Sharpe said despite continued chaos in the global economic environment, the year 2011 was a very successful year for Pramerica in the Asia-Pacific region. The S$3 billion (RM7.3 billion) fund, which is managed by the Singapore-based company, last year consolidated its popular closed-end Asian Retail Mall funds into a private open-end property fund for institutional investors looking to take advantage of opportunities in Asia's growing retail sector. "What this new fund structure means for our investors, Pramerica and Malaysia is quite significant as the conversion allows us to maintain a more long-term position in the Singapore and Malaysian markets, where we do not have exit assets because of structural reasons, namely the term of our investment funds coming to an end," Sharpe said. Naza TTDI and Seacera in joint venture? PETALING JAYA: Naza TTDI Sdn Bhd, the property arm of the Naza group, is likely to join forces with ceramic tile maker Seacera Group Bhd in a 500-acre mixed development project in Ulu Langat, Kajang , sources said. Both parties met last week to discuss the probability of collaborating, a source said. “The emergence of Naza TTDI - which launched last year its TTDI Grove mixed development project in the same vicinity and enjoyed a good take-up rate for it, will value-add Seacera because of its (Naza TTDI's) experience in the same land area. “The collaboration will also be good for Seacera's tile business which will be complementary to the property project and give Seacera additional income,” the source noted. In terms of benefits to Naza TTDI, the company has said that landbank expansion is its priority and this deal will enable it to gain direct access to more land in the Kajang area, having used up most of its landbank for its 113-acre TTDI Grove project. No specific details on the joint-venture are available at this point. StarBiz reported recently that Seacera will this year kick-start a 500-acre mixed development project in Ulu Langat with a gross development value of at least RM2bil that will span over 10 to 15 years. Of the 500 acres, Seacera owns 113 acres, which it bought from land owner Duta Skyline Sdn Bhd for about RM27mil or RM5.50 per sq foot. The remaining land is currently owned on a 78:22 joint-venture basis with Duta Skyline, with the larger portion owned by Seacera. Shares in Seacera have surged 47% over the past two weeks, ending at 76.5 sen at yesterday's close. Recently, some four million shares were crossed to unidentified buyers, suggesting that there could be new major shareholders coming into the company. It is learnt that corporate personality Datuk Samsudin Abu Hassan, who was one of the major shareholders of the company, has exited the company completely. For the third quarter ended Sept 30, 2011, Seacera made a net profit of RM981,000 on sales of RM24mil. KUALA LUMPUR: Dijaya Corp Bhd, which launched Tropez Residences in Iskandar Malaysia, Johor last month, has sold more than 85% of its Tower A within the first month. “We are very pleased to receive this strong response from locals and Singaporeans in such a short time. Following the positive response, we have launched our second phase, Tower B,” group chief executive officer Tan Sri Danny Tan said in a statement. Tropez Residences is a 38-storey bay-front serviced apartment in Tropicana Danga Bay. The latter is a RM3.8bil integrated project spanning 37 acres in Iskandar Malaysia. It offers a comprehensive mix of lifestyle properties, offices and commercial blocks, as well as a hotel and a shopping mall. Tropez Residences consists of 1,149 units with choices of duplex, 3 or 4-bedroom units and also 1-bedroom studio with built-up areas ranging from 463 to 1,798 sq ft. The serviced apartment offers comfortable and luxurious living with more than 20 facilities. There will also be two open air sky lounges in towers A and B with spectacular panoramic view of the development and beyond. Tropez Residences will also be connected to the entire Tropicana Danga Bay development via a level-six walkway. Dijaya said two show units Type C (1,163 sq ft) and Type D (1,668 sq ft) were ready for viewing. By next month, the company said, it would unveil two more luxurious show units, Type A (689 sq ft) and Type S1 (463 sq ft), to provide more inspirational ideas on interior decoration. Tropez Residences is expected to be completed around 2014. WELLINGTON: New Zealand’s housing market finished last year on a firm footing, but the outlook for 2012 is uncertain because of the European debt crisis, government property valuer Quotable Value (QV) said. QV said that its residential property index was up 2.4% in the year to December, after a 1.7% increase in the year to November and a 1.2% rise in October. The index was now 3.5% below its peak in late 2007. Recent data have suggested some stability in the housing market, after a sluggish 2010 because of weak domestic consumption and a slow wage growth. “Despite national values moving upwards during the year, the property market continued to be characterised by lower than normal sales volumes,” said QV research director Jonno Ingerson. He said sales numbers in 2011 were more than 20% below the long-term average, but were higher compared with 2008 and 2010 when they were marked by low activities. The average sale price, which is not used to calculate the main index, over the three months to December slipped 3% to NZ$398,411 (US$305,407) compared with a year earlier. Looking forward to 2012, QV said Auckland, the country’s biggest population and business centre, would prosper further because of a growing population. “While business and consumer confidence seems to be on the increase, there is still some concern about the financial situation in Europe, and what may happen to the New Zealand economy,” Ingerson said. Prices in Auckland rose 4.3% on a year ago and are now 1.4% above the previous peak in late 2007.